As IE6 and IE7 users throughout Europe turn on their Windows Vista- and XP-based computers to notice, for the first time, the opportunity to switch Web browsers from Microsoft Internet Explorer to something they may have never heard of, their manufacturers are preparing for an influx of new customers. But they may also be preparing to lower expectations just in case the market share numbers for Firefox or Chrome or Opera or Safari fail to swing wildly positive overnight. Last week, Mozilla launched its opentochoice.org blog, ostensibly to help spread the word about the impact the choice screen may make on European computing habits. On Friday, however, the blog posted the results of a six-country, 6,000 respondent consumer poll conducted by advertising research firm Ipsos MORI. The firm itself has yet to post detailed results, though the question it posed to consumers may as well have been an advertisement: "Were you aware that the European Commission has adopted a decision ensuring the millions of Microsoft users across the European Union who have Internet Explorer installed as their default Internet browser will now have to be offered the chance to choose the browser they want to use via a choice screen which appears on their PC/Laptop screen?" Only 30% of respondents in Poland answered yes to the above question, with 19% of Spaniards replying in the affirmative. Results for participants in France, Germany, Italy, and the UK fell in-between. Friday evening, a member of Mozilla's new blog with the handle Pony wrote candidly about being suspicious that the choice screen was some kind of malware: "I wasn't aware of this. The browserchoice window popped up on my laptop today and I was pretty suspicious and tried to close it down. There wasn't an explanation of why it was there, and it was so bland that I thought it was some dodgy pop-up trying to trick me into downloading something bad. I even looked up browserchoice.eu on a Whois to see who owned it, but still thought it was dodgy as I didn't see quite why Microsoft would own a domain like this rather than use their well-known "trusted" microsoft.com. Feel a bit stupid now -- I've been meaning to download Firefox for ages." 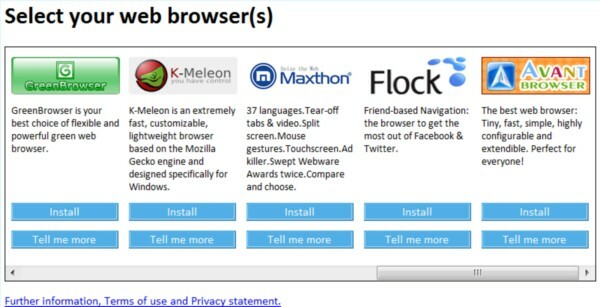 The final browser choice screen, available from browserchoice.eu. In order to allay concerns from browser makers that Microsoft would give itself top billing on the browser screen, the company promised to the European Commission that it would randomize the order of the top five browsers in the first panel, so that IE8 would not always appear first. Right away today, there were complaints in some circles that Microsoft wasn't really randomizing the order. These numbers were probably impossible to resist for IBM software architect Rob Weir. You may recall Weir from his prominent involvement in the ODF/OOXML debate three years ago. Weir was an active opponent of Microsoft's Office XML standard being approved by the ISO, though throughout that episode, he always accepted the facts in front of him. So Microsoft's solution, once again, is somewhat inelegant. But who does it benefit? Not exactly Microsoft, Weir discovered. The distribution of the random pattern should give each browser 20% distribution on every slot, if it were fair. As it turns out, IE, Firefox, and Safari all get about 25% distribution in the #1 (leftmost) slot, with Opera #1 16% of the time and Chrome #1 9% of the time. More often than any other slot, IE is positioned #2 (28%), Firefox is positioned #2 (28%), Opera is positioned #3 (26.4%), Chrome #4 (38%), and Safari #5 (53%). Although it's tempting to blame the randomization function in IE's library, Weir blames the developers of the browserchoice.eu Web site: "So given the above, we know two things: 1) The problem is real. 2) The problem is not related to a flaw in Internet Explorer."